Spotted at an event at 45th and Broadway. The Oaksterdam mural, previously shown in progress, is now complete. The artists are R.B. Moore III and Munir Sharif Munir. The nascent controversy faded away, and now most people seem to like it. What do you think? Here's the music building at Mills College. Several of the buildings on campus date from the early 20th century when Spanish style was popular. Stucco, tiles, and wrought iron are such a pleasing combination. For more unmodified photos, visit SOOC Sunday. Spotted at the Union Point marina. This boat harkens back to a different era, don't ya think? Blue skies and warm weather have been with us for a few days. For sky shots from around the world, visit Skywatch Friday. The Great Wall, that is. 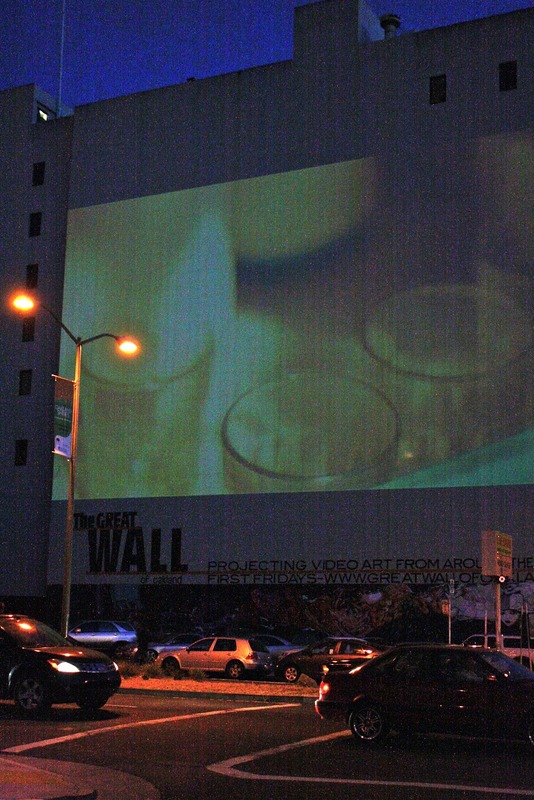 No, not that Great Wall, the Oakland one. During Art Murmur (first Friday of every month), along with art gallery shows, the side of a building is used as a projector screen for art videos. It's located on W. Grand between Broadway and Telegraph Avenue. Despite a pumped up ISO and some computer voodoo, this is the best I could do to give you an idea of what the scene is like. For more "W" themed photos, visit Mrs. Nesbitt's meme. On a tip from «Louis La Vache» I scouted this mural by Beth Emmerich at 25th St. and Mandela Parkway. Eye catching to say the least. Reminds me of Mexico's iconic La Caterina. Much to my surprise, I also found several more murals on the other side of the building. By good fortune, Oaktown Art posted an article on Friday about these murals, all done by women earlier this month. Check out her interview with the artist who organized the effort. Lake Merritt draws a wide variety of bird life. Don't know the names of these, but those blue bills are hard to forget. Visit SOOC Sunday for other unaltered shots. I'll be out of town for a few days, so will not be able to leave comments. Automated posts will ensue. The Howden Building is located at Webster and 17th St. 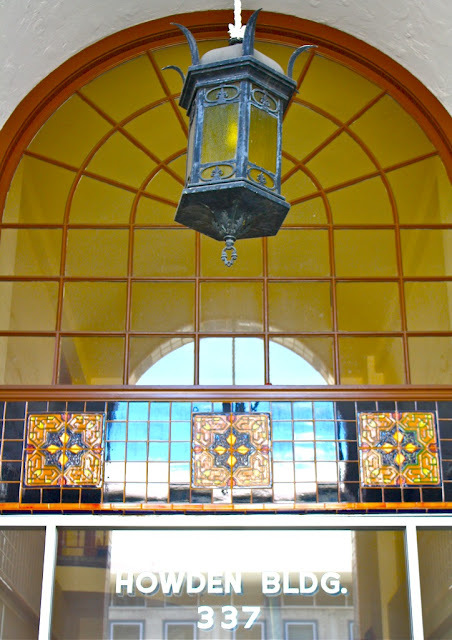 The tiles above the entry hint at the tiled facade and a wide variety of tile within. 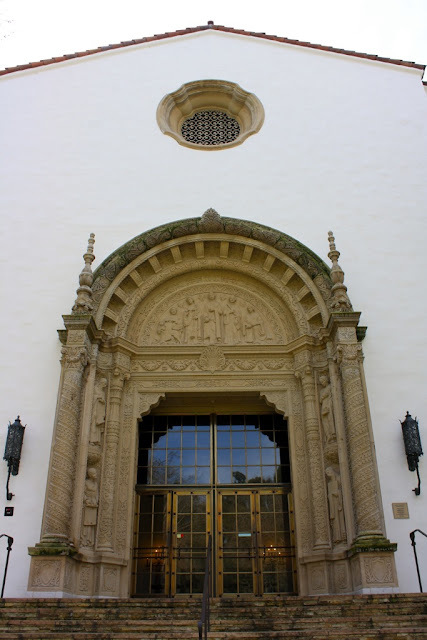 It was built in 1925 by Robert Howden, who had a tile business in Oakland for 30 years. Originally from Scotland, Howland is also known for building a castle home in the Santa Cruz mountains. This building now houses many different retail and office spaces. Linked to Weekend Reflections. 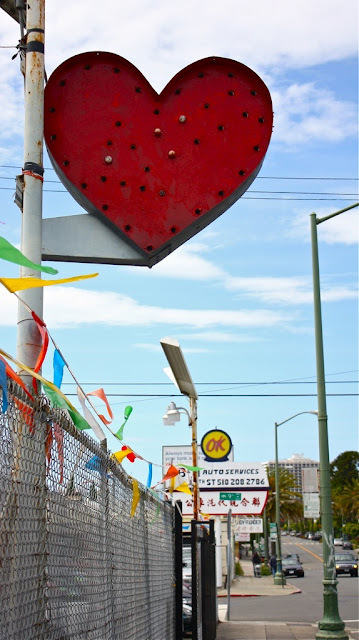 While driving down E. 12th St., this heart jumped out at me. I like the way it contrasts with the blue of the sky. Wish the lights still worked. For more sky shots, visit Skywatch Friday. What could this be? 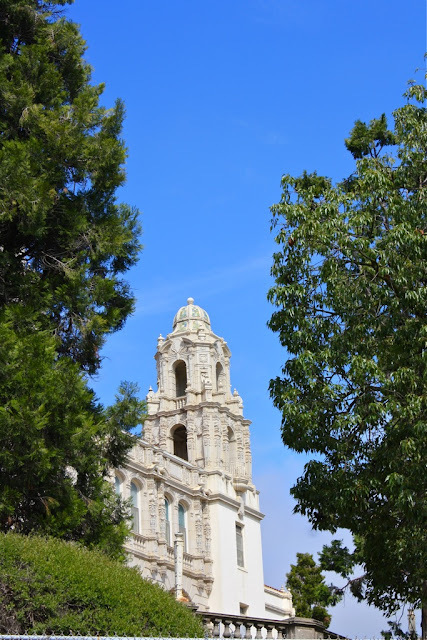 A California mission? A college campus? An hotel? Nope. This is Highland Hospital, the county hospital and trauma center. This building dates from 1927 when the original hospital opened. The hospital sits on a 16-acre hilly lot just off the 580 freeway. Although many of the original structures remain, a vast, modern complex was opened on site in 2004. Voila! is a local juice company that has made good. Their warehouse is located in Jingletown. Can't miss their trucks. For more "V" photos, visit the popular meme ABC Wednesday. Dan Fontes is adding to his Emergent Sea mural featured yesterday. Although you can readily see the mural from the freeway, finding the street it's on is another story. I had to circle the area a few times before I found the circuitous route there. Whew. Mission accomplished. This sea turtle was create by mural artist Dan Fontes, who has previously been featured here and here. You can see this Jingletown mural from the 880 freeway. Thanks to Oakland North I learned that Dan is adding two more turtles to this work. His new project has been a hit with the local kids. Will post an "in progress" shot tomorrow. Another evening shot of Lake Merritt with the Necklace of Lights. Submitted to Weekend Reflections and SOOC Sunday. 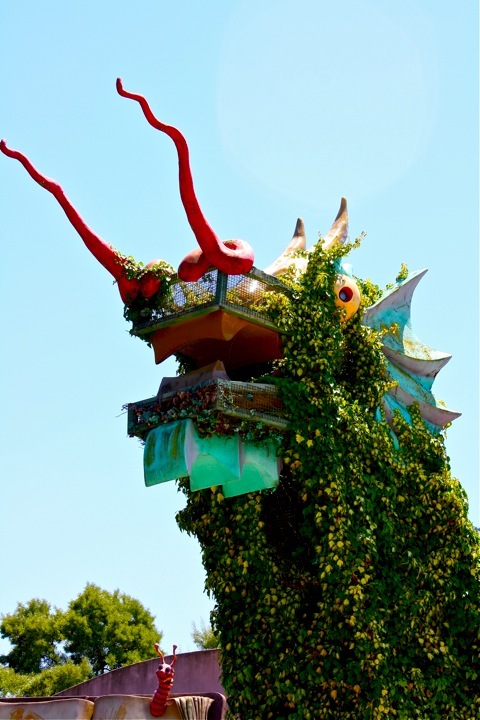 This dragon stands at the entrance to Children's Fairyland. The little critter at the lower edge of the photo is a book worm, of course. Fair skies for the next few days. Almost feels like summer. For more sky scenes from around the world, visit Skywatch Friday. This mural decorates the north support structure of the 580 freeway on Grand Avenue. Parts of this massive mural have been featured previously. The focus here is Calvin Simmons, conductor of the Oakland Symphony until his premature death in 1982. 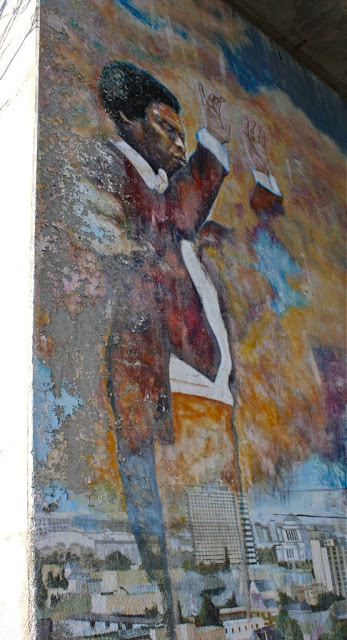 This mural is located kitty korner to the Grand Lake Theater. Spotted at Lake Temescal. I imagine a child picked this bouquet of wild flowers, got distracted (ooh, look at that butterfly! ), and accidentally left it behind. I was surprised at the color accuracy of this image straight out of the camera. Shows that even a blind squirrel finds an acorn now and then. 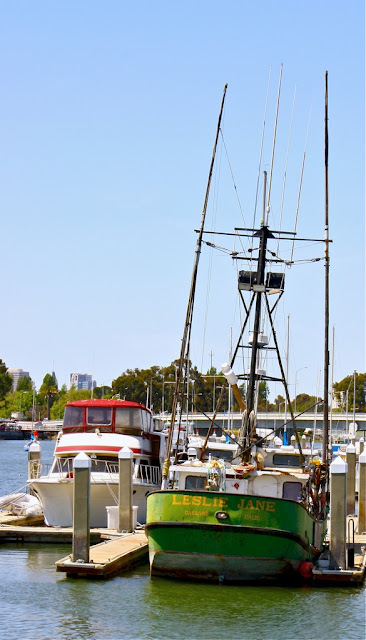 For more unaltered images, visit Jan's meme SOOC Sunday. 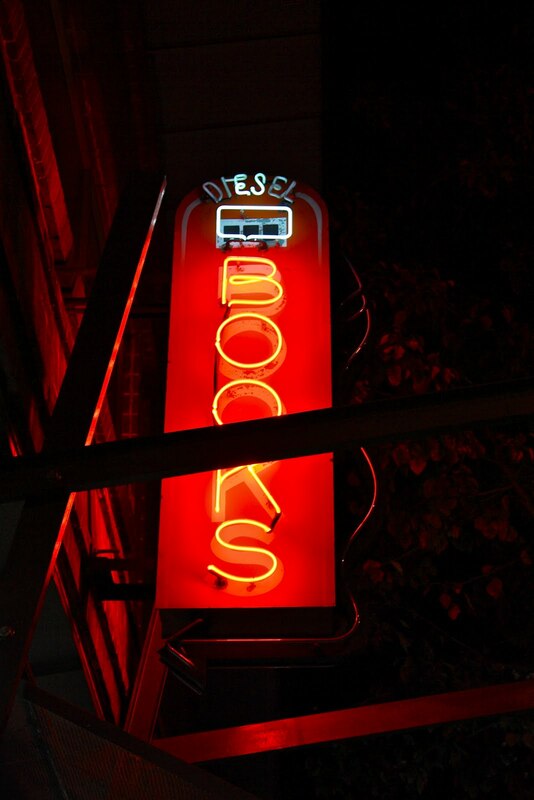 Diesel is one of several independently owned bookstores in town. It's housed in an old brick building in the Rockridge district. They've done a good job of preserving the old architecture while creating a warm and welcoming space. Looking west toward Angel Island from Mt. View Cemetery. No rain today but more is on its way. For more sky shots, visit Skywatch Friday. This video is of an Oakland dance crew called Turf Feinz. Turfing is a dance form developed in Oakland that to my eye looks like it has its roots in break dancing. But you'll see it has new features including "bonebreakin'" and "tuttin'". I first saw this video last summer on Gene's Our Oakland blog and was amazed at the agility and spontaneity expressed in this dance form. In the fall the local paper ran an article that told the back story about their dance in the rain. 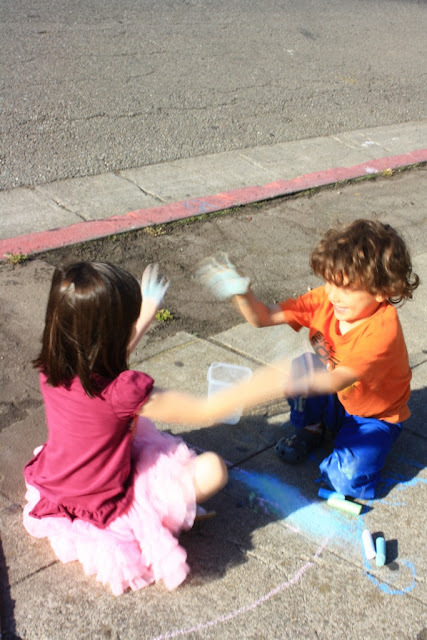 The dance occurs in East Oakland on the corner where their friend was killed by a hit and run driver the previous day. A minute or so into the video you see two new dancers enter the scene. Friends with no bus money, they ran half way across town to join the memorial dance. This YouTube video has had almost 3 million hits. To view it in a larger format, go here. For more "T" posts, visit ABC Wednesday.